On the morning Saturday July 28 there will be the an excellent total eclipse of the Moon, the second since our total lunar eclipse of January. As with the January Eclipse, this one will be a rather special eclipse, but for different reasons. The January 31 Lunar eclipse was the first seen by Australians since 4 April 2015, it was also close to perigee (when the Moon is closest to Earth) leading to some folks calling it a "super moon". This eclipse, with a totality lasting 104 minutes, is the longest this century. It is also close to apogee, making the moon a "mini-moon", much smaller than its perigee counterpart (see diagram above). So telescopic images of the eclipsed moon from these two dates should show an observable size difference if the same magnification is used for the images (if you have a good memory and good eyesight you may even notice the difference with the unaided eye). You will also see some sites calling this a "blood Moon", The Moon does not turn the colour of blood, but will go a deep copper colour due to the refraction of red light through our atmosphere. This will be a fairly deep eclipse with the Moon becoming quite dark, it may even go a dark grey/brown and become hard to see. Unfortunately, the July 28 eclipse occurs in the early morning. Fortunately it is on a Saturday so you head back to bead later. It starts well before astronomical twilight in all of Australia. All Australia gets to see the deepest totality, but in the eastern states totality ends after the Moon sets, central states gets to see totality end (just) and only Western Australia sees the entire eclipse. Totality is long and deep, 104 minutes, the longest this century. January's total lunar eclipse was only 76 minutes long. You don't need special filters or fancy equipment to watch the lunar eclipse, you just need your eyes and somewhere comfortable to sit and watch. Watching earth's shadow creep across the Moons face, as the stars begin to appear again is quite beautiful. 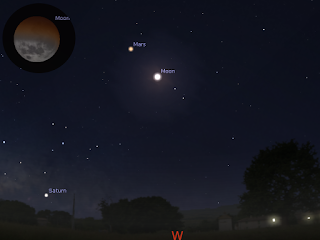 The Moon is very obvious to the west with bright red Mars close by, and Saturn below. 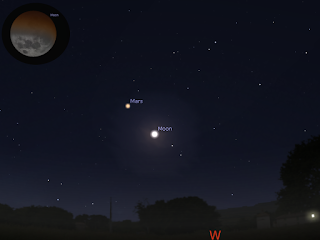 The contrast between the deep coppery red Moon and the ruddy Mars will be interesting. Binoculars or a telescope are a plus, but not necessary. 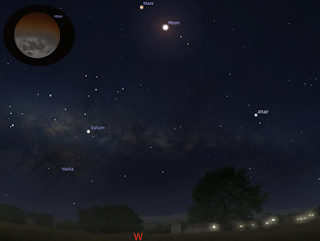 If you have a telescope, point it at ruddy Mars, as it will be just past opposition and big in even small telescopes. The massive dust storm s abating, so you my see some detail. A guide I wrote for the October 2014 lunar eclipse to taking photos of the eclipse is here. On the East coast, the eclipse starts when the sky is quite dark at 4:24 am AEST and Totality is at 5:30 pm AEST, so the Moon will appear to be a burnished copper disk in a dark sky full of stars. Totality occurs as the sky is paling and maximum eclipse occurs at civil twilight, so the Moon may be difficult to see against the brightening sky. As this is quite a dark eclipse of 1.6 depth, it may even end up dark grey or brown. In the central states the eclipse starts before astronomical twilight at 3:54 am ACST and Totality begins at 5:00 am ACST when the sky is still fully dark. Central states will also see the eclipsed Moon in all its coppery glory accompanied by red Mars. The colour contrast will be interesting. In WA, the eclipse starts with the Moon quite high and all of the eclipse is seen. The eclipse starts at 2:24 am AWST and Totality begins at 3:30 am AWST. The eclipse starts reasonably high in the sky and is good viewing from almost anywhere, urban, suburban or country. You don't need to move from your backyard unless there is a high-rise bocking your view to the west. It is the dead of winter so don't forget to get seriously rugged up, and have some hot drinks on hand. While in the early morning it is still worth getting older kids up tow watch this once in a century event. New Zealand sees only the beginning stages of the eclipse. Weather: Cloud cover predictions can be found at SkippySky. Southern Skywatch July 2018 edition is now out!